There was a time in fantasy football history where quarterbacks were taken in the first round. In 2012, according to Fantasy Football Calculator, three quarterbacks were taken in the first round in a 12-team PPR draft. Now this was six years ago, and quarterbacks have slipped down draft boards since then. In 2018 we aren't seeing the first QB go off the board until late in the third round. You may still have those one or two owners who take a quarterback super early, but for the most part people hold off. That being said, there are quite a few quarterbacks available after the eighth round that are solid veteran QBs that could easily outperform their ADP. We will look at five that you can wait for and still have a very productive season at the quarterback position. Matthew Stafford has probably been one of the most undervalued quarterbacks in fantasy football in the last seven seasons. Since 2011, Stafford has thrown for over 4200 yards in every season. In that time he averaged 29 touchdowns per year. In 2017, Stafford completed 371 of 565 attempts for 4446 yards, 29 touchdowns, and only 10 interceptions. Stafford has solid wide receivers in Golden Tate and Marvin Jones, and hopefully will get more time in the pocket with an upgraded offensive line. The addition of running back Kerryon Johnson might allow the pass game to open up even further. Now we don't know exactly how the OL will look (the Lions signed a few players, as well as drafted a center in the first round of the NFL draft), but it hopefully will be a bit better than last year. 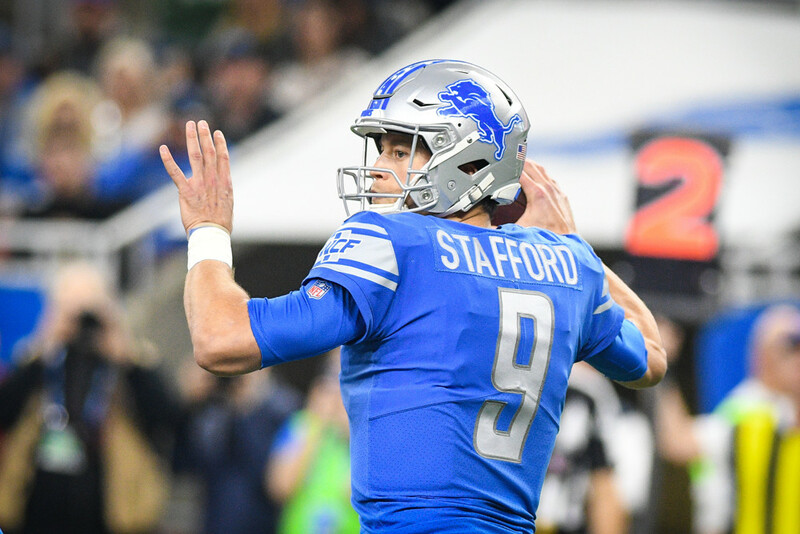 Currently, Stafford is being drafted late in the ninth round (9.09) in 12-team PPR drafts. He is the 11th QB off the board. Waiting until the ninth round for a QB as good and consistent as Stafford may allow owners to build a solid team without spending the draft capital on an early QB. Another quarterback who is generally undervalued, Philip Rivers had another solid season in 2017, completing 360 of 575 attempts for 4515 yards, 28 touchdowns, and 10 interceptions. Rivers has been a bit more consistent than Stafford when it comes to touchdowns, but he also averages around 30 per season. Although Rivers took a slight hit with the loss of TE Hunter Henry, he still has plenty of weapons in that offense. Keenan Allen had a huge year in 2017, and RB Melvin Gordon should continue to not only open up the pass game, but has proven he can catch passes out of the backfield. The Chargers also have plenty of speed at WR, and most likely will bring in a solid TE before the season starts. Rivers is currently being drafted early in the 10th round (10.04). He is the 13th QB off the board. Rivers, like Stafford, is a consistent QB that easily could finish top 10 in fantasy. It's amazing how far down Ben Roethlisberger has fallen on draft boards. Maybe it's because he is old, or maybe it's because he isn't as flashy as some of the newer QBs coming into the NFL. Roethlisberger is currently being drafted at the back of the 10th round (10.11), or the 14th QB off the board. His 2017 season wasn't anything off the chart, but it was very comparable to both Rivers and Stafford's seasons. Roethlisberger completed 360 of 561 passing attempts for 4251 yards, 28 touchdowns, and 14 interceptions. He still has two of the best players in football catching passes: Antonio Brown and Lev Bell. He also has second-year WR JuJu Smith-Schuster and speedy rookie James Washington. Add all that up and combine it with the fact that Todd Haley is gone (apparently there was a riff between the two) and a soft opening schedule, (they get the Browns twice, a decimated Chiefs secondary at home, and a bad Buccaneers' defense all in the first eight weeks) you may get huge numbers from Roethlisberger. Another older, boring quarterback, Eli Manning had an awful year in 2017. He lost almost every one of his targets at some point in the season. In one game alone he lost OBJ, Brandon Marshall, Sterling Shepard, and Dwayne Harris. Most of those players he lost for the season. Manning managed to complete 352 of 571 pass attempts for 3468 yards, 19 touchdowns, and 13 interceptions. Manning should have a much better season in 2018. OBJ and Sterling Shepard are healthy, and the Giants added a key piece to their offense in drafting RB Saquon Barkley. Barkley can catch passes as well as make the Giants' running game good enough to allow Eli to run play-actions. Manning is being drafted at the end of the thirteenth round (13.11). He is the 21st QB off the board. With all of his weapons, there is no reason why Eli shouldn't have a bounce back season. Only two seasons ago he threw 35 touchdowns, so it's not out of the realm of possibility to draft a top 10 QB gem in the 13th round. Jameis Winston was one of the most hyped up quarterbacks prior to the 2017 season, but left fantasy owners disappointed. To make matters worse, Winston was suspended for three games to start the 2018 season. Thanks to that, he is being drafted in the 14th round at 14.04. He is the 22nd QB off the board. So why is he undervalued? He has shown promise, often throwing for over 300 yards in games. He did it six times in 2017. He finished with 3504 yards on 282 completions (442 attempts). He also had 19 touchdowns and 11 interceptions. He did miss three games due to injuries as well. This may be Winston's last chance in the NFL. He needs to show the Buccaneers why he was first overall draft pick. He has the weapons, he has the athleticism, and he has shown, at least in his first two seasons, that he can be a competent quarterback. Unless you are in a two QB league, Winston can probably be undrafted and picked up off waivers before his suspension is up. He can be a QB-1 if he plays like he did in 2016.